In the sixth grade, I remember learning about World War II, and specifically about how overmatched the Polish people were against the mammoth German war machine. We were told that in some battles the Poles had no choice but to send out warriors on horseback armed with sticks to fight off the invading German tanks. That’s right horses and sticks against tanks. A lot of the children in the class laughed at the silly Poles and their feeble defense. I, however, stood up for my fellow Poles, and in fact was proud that we’d continue to defend ourselves against seemingly impossible odds. The vast majority of the class argued that the Poles should have laid down their weapons and gotten off their horses once they saw tanks rolling through the countryside. I argued that the Nazis were such an evil force that the Poles should be commended for fighting them, even though it was apparent to both sides that the Poles would be slaughtered. I argued that the slaughter would happen no matter what so the only course of action was to fight and keep fighting until your last breath. Having had two grandparents survive concentration camps, I knew that there was nothing to gain by surrendering. As my friends and readers know, I lean quite heavily towards pacifism, so to admit violence is justified is quite a bold statement on my part. It takes serious fortitude to fight tanks with horses and sticks. Growing up as a Polish-American (born in the U.S.A., but both my parents were born in Poland, in fact I’m the first American in my direct family), I heard a near infinite list of Polish jokes. It didn’t really bother me then, and still doesn’t, as I understood they were just jokes and also knew they didn’t really have any foundations in truth. In other words, if the joke was good I’d usually laugh but if anyone thought the jokes were actually representative of the Polish people I’d quickly set them straight. That brings me to the whole point of today’s post, which is to bring your attention to a war story I remember hearing about before but not fully researching. During World War II, a contingent of Polish soldiers were stationed in Iran. It was there that the soldiers found a small bear cub wandering around by himself. The soldiers adopted the bear and called him Wojtek. They quickly grew very fond of Wojtek, who would drink milk from a vodka bottle [us Poles love our vodka 😉 ]. As he grew up Wojtek replaced the milk with bottles of beer and lit cigarettes. In fact, Wojtek enjoyed beer so much that once he finished a brew, he’d bring the empty bottle up to his eye and look inside to make sure it was empty before tossing it aside [here’s a link to a Polish newscast on youtube telling this story]. The soldiers became so attached to the bear that he went with them from battle to battle and was officially drafted into the Polish army! Who was more badass, the Nazi-fighting bear who wrestled full platoons of trained soldiers, or the men who routinely got body-slammed by him for shits ‘n giggles? Good question Robert. I say they’re equally badass. When he wasn't fighting Nazis, Wojtek would wrestle with his fellow soldiers. If all that wasn’t enough, Wojtek the bear also learned how to work the troop’s showers and would often go in to cool off. The bear would shower so often that the soldiers had to lock the shower to prevent Wojtek from using up all of the water! Still, the bear would continue trying to use the showers and one day found the door unlocked. Upon entering the showers, the bear found an Arab spy inside, who upon seeing the bear immediately surrendered and gave up the location of his fellow soldiers. Wojtek was a legitimate war hero and surely deserves a memorial in his honor. After the war (of course the bear’s side won), Wojtek settled in an Edinburgh zoo, and many of his fellow soldiers settled in around him. His soldier friends would visit Wojtek at the zoo, often bringing him beer and smokes, and even sometimes hopping into his den for a quick tussle with the bear. Anyway, I’m wicked proud to be Polish-American and this story just makes me even prouder. Now, anyone got a good bear joke? Note, it is my understanding that all the photos used above are in the public domain. If you are the copyright holder of any of the above photos, or have reason to believe they are copyrighted, please let me know. Never heard of this story before. I actually it’s very educational. BTW, Wojtek was a true hero! Also I had never known that the Polish army fought against the German army with horses and sticks. You should definitely be proud of your nation! P.S. 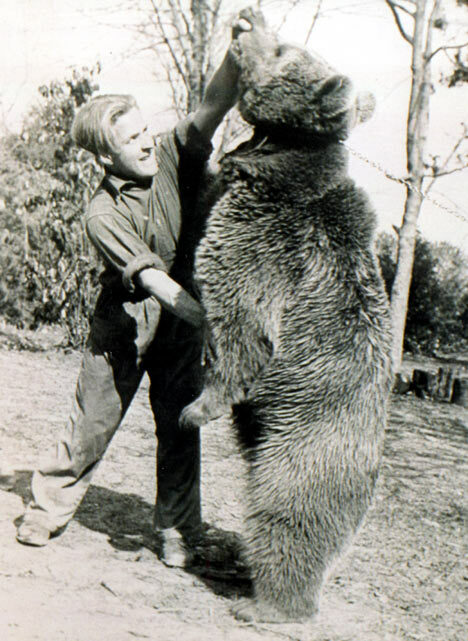 I would be too scared to wrestle with Wojtek! The Polish army NEVER fought against the German tanks with horses and sticks. Can’t you hear how stupid it sounds? This is one the most common sinister lies the German propaganda machine came up with during the second world war. Adam Pieniazek means well however his knowledge of Polish history is poor. Wojtek’s story is true though. You’re right AdamB. As mentioned in the post, the sticks and horses stories is what I was taught in the 6th grade. You and other commenters have pointed out to me that it was propaganda, not fact. Thank you! You may also like to know that at the battle of Mokra (September 1, 1939) the Polish Cavalry Brigade “Wolynska” halted the attack of the German 4th Panzer Division. The cavalry brigade destroyed over 80 German tanks using their AT guns and AT rifles (kb UR). The Polish cavalry in the 1930s used horses for transport (just like Germans) but they fought on foot (mobile infantry). Many European armies also used bicycle infantry during that time. Fortunately even the Germans did not claim that the Poles charge their tanks with bicycles. Another war myth which is widespread in the West claims that the Polish Air Force was destroyed on the ground in September 1939. The truth is that the first wave of the German bombers failed to even reach Warsaw as they were intercepted by the Polish Air Force. Interesting story. I will be remember about photos. Thanks for sharing the story. I’ve since retired from the military in Feb 2005, after serving 26 years. There are many stories I can share about mascots and such, but this one tops the list! Thank you for your service Tony. I’m sure your 26 years in the military led to a lot of interesting experiences, but you’re right, it’s tough to top Wojtek. What a story! POLES DID NOT CHARGE TANKS IT WAS PROPAGANDA, EVEN THE FOOTAGE IS GERMANS DRESSED AS POLES!!!! Origin of Polish “jokes” came from Nazi German propaganda that was then pushed by Soviet communist sympathizers in Hollywood. The racist stereotype that Poles are intellectually inferior or have subhuman intelligence came from Nazi German propaganda and Soviet propaganda. For example, the MYTH that Polish horses were used to attack German tanks in WWII was total Nazi German propaganda that the Nazi Germans repeated over and over until it took a life of its own using the BIG LIE technique. The Soviet Communists saw the value of this myth and the racist notion that Polish people have subhuman intelligence, so they had their Left-Wing sympathizers in Hollywood push it using Anti-Polish Television and Movie imagery to the American people. The image of Polish people having subhuman intelligence was useful to the Soviet Communists, since then, people would not mind too much if Poland is occupied by the Soviet Union if Poles are portrayed as having a Slavic culture that is inferior and less then human. As for the German Nazis (and even the Soviets) they then killed off the educated class of Poland first to make their racist stereotype of Poles a reality. Polish “jokes” were in Hitler’s two speeches after he invaded Poland. Hitler ridiculed Poles in his Sept. 19, 1939 speech in Danzig (today called Gdansk) and in his Berlin speech in Oct. 6, 1939 with these hate-through-humor anti-Polish “jokes” and references. Ironically, Left-wing Hollywood and the TV Networks (like NBC-TV) pushed these racist Polish “jokes” even though they claimed to hate Nazis. Hollywood and NBC-TV evidently hate Nazi propaganda but not when its applied to Poles. Hollywood and Network-TV (NBC) have a deep hatred for Anti-communist, Pro-American, Pro-Catholic Poland. The recent movie “Katyn” shows the German Nazis and Soviets killing the educated Polish class in Poland in order to make Poland “intellectually inferior” and easier to rule. This was during the time Nazi Germany and Soviet Russia were collaborating with each other to destroy Poland as per their Molotov-Ribbentrop pact to destroy Poland together. Many Polish Americans who lived before this time have reported that they never heard these racist jokes until AFTER they were introduced by Left-Wing networks like NBC-TV in conjunction with Hollywood. NBC-TV launched Polish-bashing shows such as “Laugh In” which ridiculed Polish people constantly. In addition late night bigots were encouraged to bash Poles with “jokes” that portrayed the Polish people as having subhuman intelligence. Therefore the power of Television and motion pictures was used to dehumanize Polish people with repetitive big lie type propaganda. Anti-Polish movies such as “The End” were some of the earliest movies meant to dehumanize Poles with racist humor. In addition other anti-Polish shows such as “All in the Family” were used to degrade the Polish people even though the left-wing producer claimed the ruse that the show was suppose to be “against bigotry”.“All in the family” was filled with racist anti-Polish sound bites such as “Dumb Polak” in an attempt to influence its viewers to have the same anti-Polish prejudice, that the Left-wing producer of the show (Norman Lear) had. This is truly an amazing story! The pictures you present in your post ad much to this article. thank You that You post that..
about Wojtek I knew from history ..
it was just to show people that Poish army was not prepared for attack and it was true… we were on map as independent country then for only 21 years (1918-1939) but every Polish person was fighting for that and felt like independent… we couldn’t get ready for any war then.. because previously Russia, Germany (Prusy) and Austria occupied us.. and army was controled by them.. they controled the numbers of everything.. This horses think reminds me about friend from Iceland who was telling me that Polish army was fighting with 1 tank..
Polish didn’t have ammo… food.. etc. The history of Poland is sad, makes me cry even thou that I wasn’t there..
but also reach… and please don’t forget that..
I’d like to thank Mr Sobanski for his post. It straights some common myths, like the one regarding “Polish cavalry charging on German tanks”. My intention is to just add a piece of information whilst on that topic. Although the 11 brigades of Cavalry were regarded as “elite”, horses in Polish Army were considered not more as the useful means of transportation. One could say the relying on them proves the inferiority of the Polish forces, in fact Germans and Russians were using cavalry, too. The cavalry moved faster than ordinary infantry and could perform some reconnaissance missions. Polish cavalry was equipped with some pretty modern weaponry, e.g. 37mm antitank Bofors guns. Whilst charging tanks or sheltered infantry would be a suicide, charging unprepared inantry would be a slaughter. Polish officers knew it and the cavalry was used accordingly. Before I come to the end with my little post: I feel sorry for the students being taught history using irrelevant and flawed sources. Thank you Sobanski, Tomek, and Damian M. for clarifying and introducing a lot of great new information to the post. Though I wasn’t portraying the story of the Polish people fighting with horses and sticks as fact, rather that it was a story that was told to me in elementary school from our teacher when we were learning about World War II. I didn’t quite believe it at the time and still don’t but it goes to show you how ingrained many of these myths became, so much that it was taught as fact in a social studies class. Also, it was a while ago that I was taught this, and the teacher may have even noted that is was just a story but my memory recalls it being taught as fact. Though, I remember our social studies books were rather old and filled with other “facts” that I knew not to be true. It is really amazing how different the history we learn is depending on where and how we learn it. Thank you again for coming by and contributing your knowledge to this post. It’s very much appreciated. Actually, during the September campaign in western Poland, there were cases where several german tanks were destroyed by the Polish cavalry. The strategy was to charge a tank and throw a granade inside…an almost suicidal tactic but shows the bravery of Polish soldiers. these pictures are so good. i cannot believe this bear. i just love this story. There are a few words about the famous or rather infamous “sticks” which were mentioned above. To cut the long story short, the “sticks” were in reality lances – light thrust spears, based on… steel pipe. I will also take the liberty to share with You two little tellings by my late grandparents. My grandfather, who saw service as an uhlan and took his part in defence of Warsaw mentioned one day long time ago that his unit was stationed by the Warsaw zoo. When it was hit by several bombs the explosions made the exotic animals scatter. The sight must be somewhat weird and absurd. I just hope my grandpa wasn’t only pulling my leg. The grandmother, on the other hand, had told me about two instances the Wehrmacht units were passing across their village near Nowogrodek (nowadays Belarus). The first one was the going towards the hearth of Soviet Union/Russia. The troops were optimistic, clean shaved, their uniforms in mint condition. Some soldiers attempted to actually BUY some fresh bread from the villagers. The other one took place later, when crushed and defeated, the German troops were being pushed back by Red Army. Germans looked far less fresh and begged for any bread, even stale one or for just some crust of it. My grandmother always pondered over the fate of the Germans in Russia, and the deterioration they underwent there. I know, these are hardly the big stories, but I wish they will encourage others to share theirs with us. First off Damian, kudos to your grandfather for fighting for Poland. My grandfather fought in WWI so I think we both have pride in our families for defending Poland to the best of their abilities. Thanks for clearing up the sticks myth. When I heard it I was a bit skeptical but I heard it in a classroom so I didn’t really know what to believe. I think the real story here is that the Polish people fought knowing they were greatly overmatched and did not give up just because the odds were heavily against them. It shows a great pride and strength. The exotica animals scampering about the city must have truly been an odd scene. I can’t even begin to imagine how it must have felt to fight in WWII. I’m sure your grandfather saw many strange, absurd and downright scary events. I wonder if the animal scene made the soldiers pause for a moment and realize the real absurdity of war in general. Though they’re “just” animals, I feel bad for them too. They couldn’t understand what was going on and only realized they had to flee. Hearing the stories from your grandmother really shows that above all, both sides had people fighting for them. It must be a dehumanizing feeling fighting this epic battles when there are so many other problems we as humans could have been focusing our energy on. Thank you for sharing your stories with us. I do hope others come by hear and share theirs. It adds a very unique and personal aspect to the overall war history. Cool story. Didnt think a bear could become so close – esp with all the gunfire. 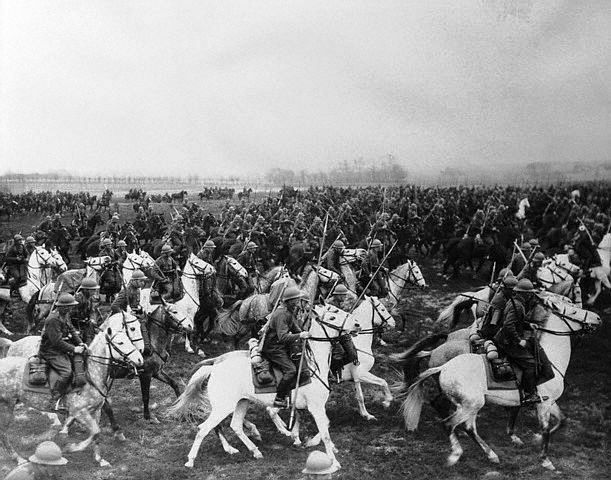 The Poles did not attack the Germans on horseback. This is only German propaganda !! !